When the Rhode Island Natural History Survey (RINHS) held its annual open house at URI’s East Farm last week, there was the usual chatter: how the latest scientific paper was coming along, what new discoveries had been made in the natural world. But what drew the most attention from the crowd wasn’t the skulls or the turtle shells on display in a glass case. It was the art. At first, this may seem an incongruity: why would a gathering of scientists, naturalists, and passionate amateurs be spending their time examining a painting the same way they would examine a Wood frog? Executive Director David Gregg has an explanation: “All of the great science expedition leaders – Charles Darwin, James Cook, Alexander von Humboldt – had artists aboard, so explorers have had artists along right from the beginning.” They call the exhibition of art hanging in their headquarters “Artists on Expeditions”, an informal name they’ve given the groups of artists who participate in BioBlitz each year. (BioBlitz is an annual event that draws several hundred people to one location in order to catalogue as many living species as they can within 24 hours.) 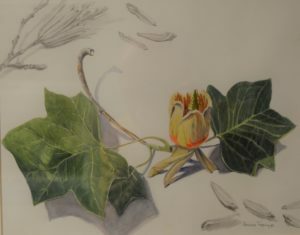 There are many pieces on display depicting moths, flowering plants, birds, dragonflies, landscapes, and a host of other observations from the natural world. Tonight, there are a few artists mixed in with the scientists. There is also at least one who is a mixture of both. 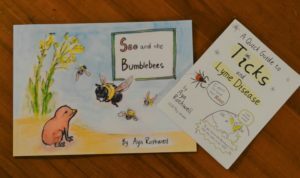 Two of Aya Rothwell’s comic books. 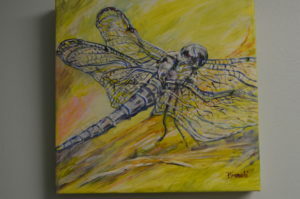 Blue Dragonfly by Ann E. Bianchi. That’s not to say that inviting artists to participate in scientifically oriented activities is always well received. 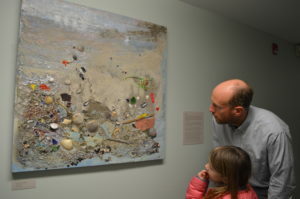 RINHS is one of few natural history organizations that conducts outreach to artists, according to Gregg. “To some extent we’ve encountered skepticism among ‘hard scientists’ kind of looking down their nose (at the ‘citizen science’ approach to BioBlitz) and saying, ‘Well, it’s not controlled’, or ‘not an experiment’ or ‘statistical significance is poor’. We’ve gotten some skepticism from scientists, but a lot of excitement among artists. 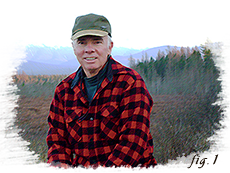 Natural historians have more in common with artists now than with laboratory scientists. And there are a lot of other ways of getting useful information out of an experience of nature than measuring the statistical significance of the molecules in a cricket’s knee. That’s useful, I’m sure, if you’re going to develop a cancer cure, but there are a lot of things that would be useful to know about the world that you’re not going to get that way. 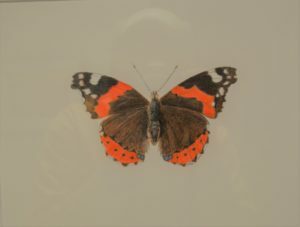 Red Admiral Butterfly by Jennifer Stone Gaines. But in a world where everyone carries a camera in their pocket, surely photography should replace paint? 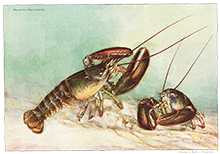 Frances Topping has spent 20 years painting natural science topics and is active in the Guild of Natural Science Illustration and the New England Society of Botanical Artists, among others. She acknowledges the value of photography, but points to something more within painting. “Photographs show one instance of one thing in one type of light, and they’re not necessarily a full picture of the subject. When you draw something, you’re seeing it in 3D, and you understand how it grows, how it’s put together, how it lives. I think art can tell that story better than a photograph. “Doing art is important. For the artist, they’re taking time to observe, and internalize and learn more about the thing. It also brings the subject to the forefront for other people who are not as aware. They may see a growth as ‘the green trees.’ But art can bring home the process of the living organism. RINHS manages to inspire and entice children and teens to explore,respect and support ‘the natural world’ in our state through their outreach and activities. They form a bridge to the next generation’s understanding and protection of our natural world! They do great work, no doubt about it, Candace!